So once again back with some great news for the Facebook fans community. The long rumored Facebook mobile seems to have come into existence. With the joint efforts of HTC and Facebook, now the facebook mobile has also come up. These 2 devices will be branded as a HTC mobiles though, have been unveiled at the Mobile World Congress in Barcelona, Spain. Both of devices will run Android 2.2 sporting a Facebook button labeled 'f' on it. Primary goal of these mobiles is to enable Facebook users to directly upload and share the photographs, status messages and links on their Facebook walls. HTC mobile with the Facebook button is as shown. Possibl it will be called as HTC Snap 2. 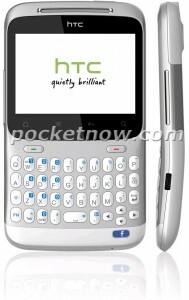 The other one looks like a modified HTC Desire, which will possibly be called as HTC Icon. You can see that Facebook button labeled 'f' at the bottom of the handset.